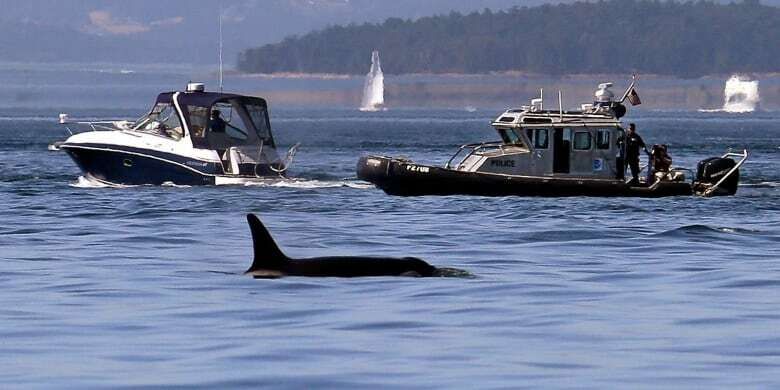 Some residents of the southern Gulf Islands are worried too many whale-watching boats are chasing too few killer whales — stressing the already at-risk species. "It's the Wild West out here on a Sunday and the orcas come by," says Susie Washington-Smyth, 75, of Saturna Island. Fellow resident Mairead Boland, 65, agrees. "Increasingly, they are pursued by a large number of boats," says Boland. "Once you've found them, you have them for a day. So it's an appalling situation for the whales." Residents report they've seen fleets of up to 25 vessels chasing orca pods during the busy summer months when whale watching is at its peak. They say the problem is compounded because there are no regulations to govern the number of whale-watching boats permitted to track killer whales. Commercial operators often share the location of pods, bringing in vessels from Vancouver, Steveston, Victoria and Friday Harbor on Washington's San Juan Island. 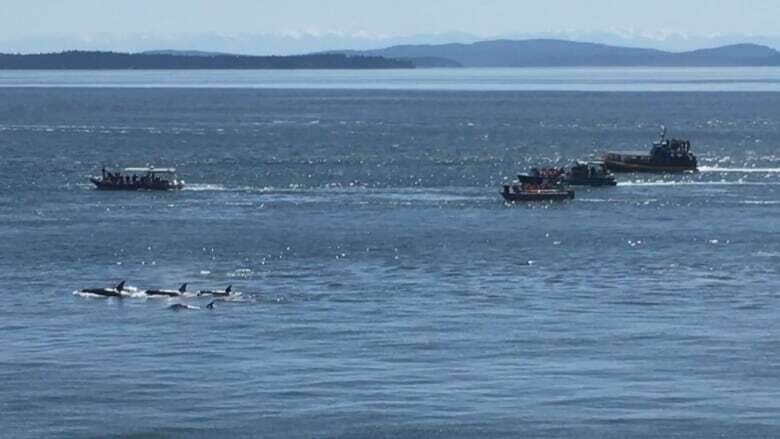 A video shot on May 13 and supplied to CBC News shows at least 10 whale-watching vessels trailing a pod of six orcas. The estimated 250 transient orcas in local waters are listed as threatened. And 76 southern resident killer whales have been listed as endangered by both Canadian and U.S. authorities. Resident killer whales subsist on dwindling Chinook salmon stocks, whereas transient orcas eat more plentiful marine mammals such as harbour seals. In recent years, concerns have been raised by marine biologists about the effects of underwater sound on all orcas' ability to detect and locate prey, and communicate. Tough new marine mammal regulations are expected from the Canadian government in the fall. In the meantime, the Pacific Whale Watching Association — representing the industry — has made changes to its voluntary guidelines. 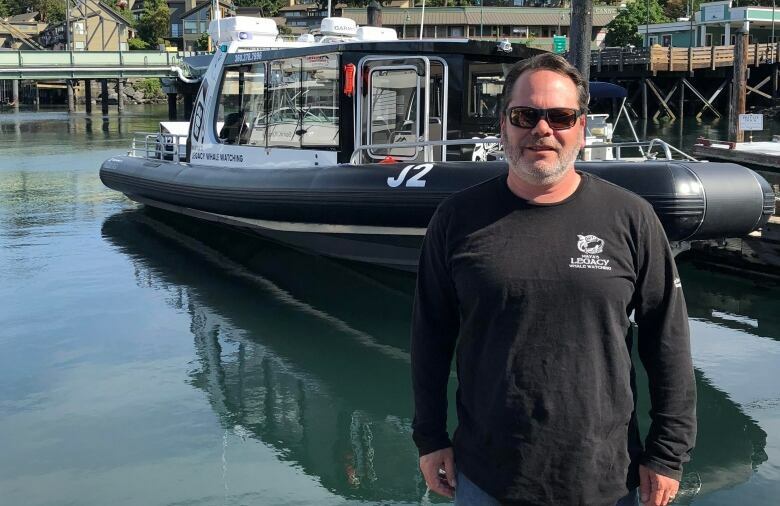 "We are limiting a vessel to 60 minutes with any particular group of whales," says association president Jeff Friedman, who operates Maya's Legacy Whale Watching out of Friday Harbor. "And if there are 10 or more boats on scene, we suggest a limit of 30 minutes." Friedman says his association is advising operators to keep 200 metres from southern resident killer whales and 100 metres from transients. CBC provided Friedman with the video shot by concerned Saturna residents. He says the orcas were transients. "[They're] very possibly some of the most successful whales on the planet right now. Their population is very robust and growing," says Friedman. "All of the boats are obeying the distance regulations, and all of the boats looked like they were certainly doing less than seven knots," he says, referring to the maximum recommended speed near pods. "I don't know that there are many studies, if any, that are showing the presence of boats having any impact," says Friedman. But the Canadian Department of Fisheries and Oceans (DFO) believes transient and resident killer whales should both be given the same 200-metre distance. "One of the impacts that we're looking at [is] what may constitute too much noise over too long of a time frame," says Paul Cottrell, marine mammal response coordinator with the DFO. While he says the industry has "very comprehensive" guidelines, he says the public should watch to make sure there are no infractions by commercial and recreational boaters. "If there's something that's being seen that doesn't look right, we want to hear about it," says Cottrell. The DFO has a 24-hour marine mammal incident hotline. 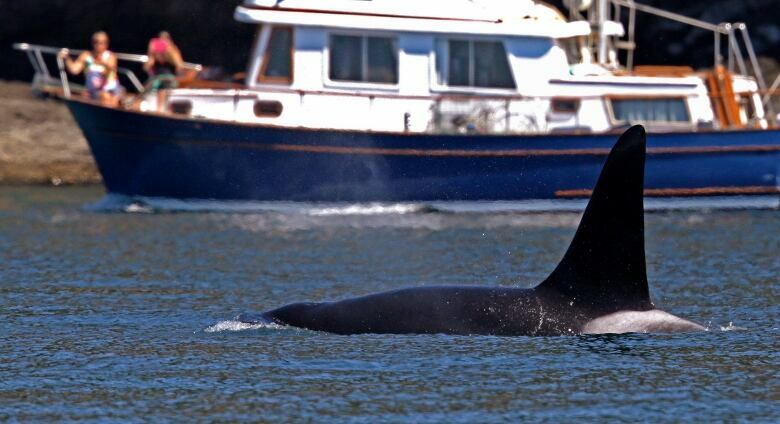 Washington State is reviewing the plight of orcas in its waters. In March, the governor created the Southern Resident Killer Whale task force to implement an "action plan for the recovery" of the orcas. And San Juan Island, home to Friedman's company, now has a voluntary no-go zone for whale-watching boats along its west coast. Friedman insists his industry has only the best interests of the orcas at heart. "This is our business — but our bottom line is the welfare of the whales," he says. 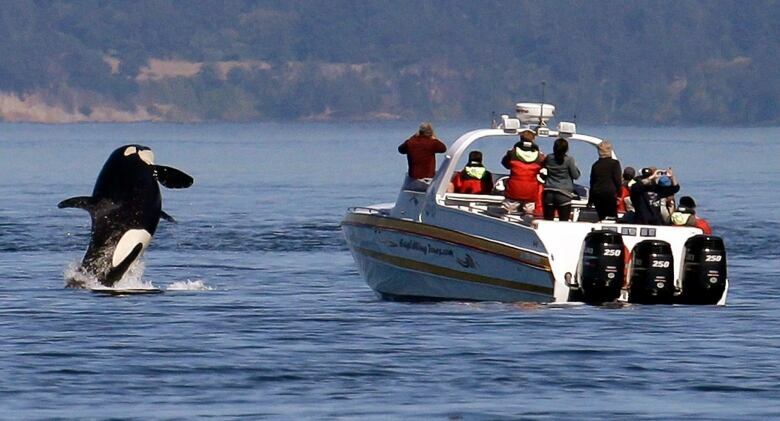 However, concerned Saturna Island residents believe the whale-watching industry itself needs to be closely watched. 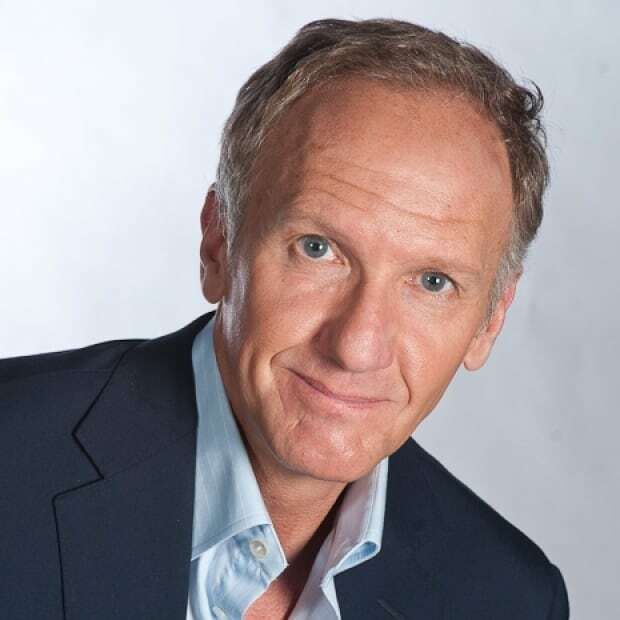 "Step back, use smaller boats, less frequently" says Washington-Smyth. "They're not going to have a business in 10 years unless they do something like that." Boland has her own warning. "Whales are delightful, but they're going to be loved to death."